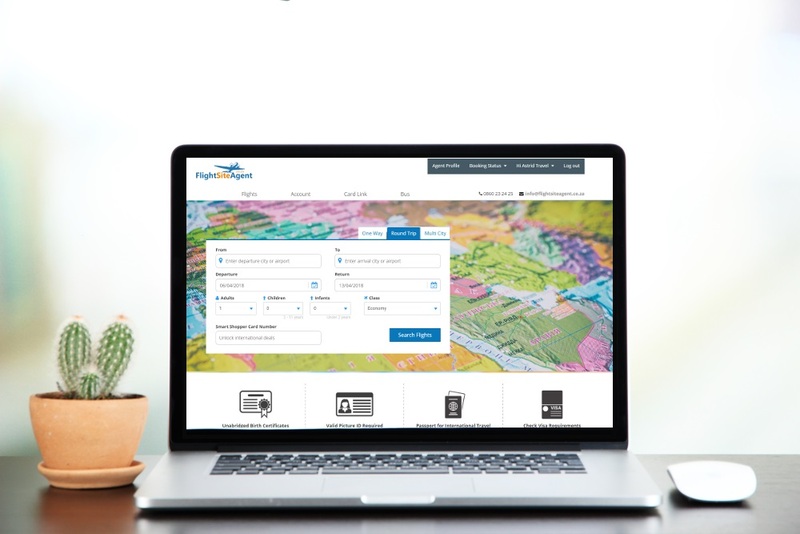 We’ve been hard at work over the last couple of months creating a new and improved FlightSiteAgent booking engine! We’ve kept all the things you know and love most from the old booking engine with a few additions we’re sure you’ll appreciate. 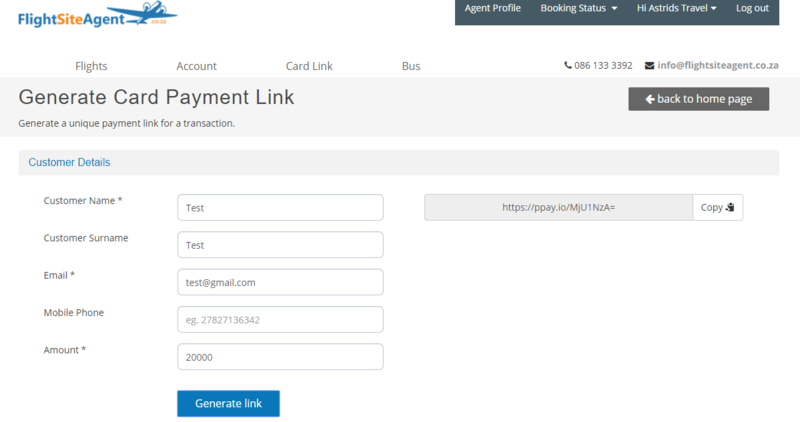 This isn’t a mere cosmetic makeover, we’ve developed a completely new booking engine with a new back end. We’re rolling out the first stage of the booking engine today, so you might want to take a few minutes to familiarise yourself with everything new. Read more below to find out what you can expect from our new system. 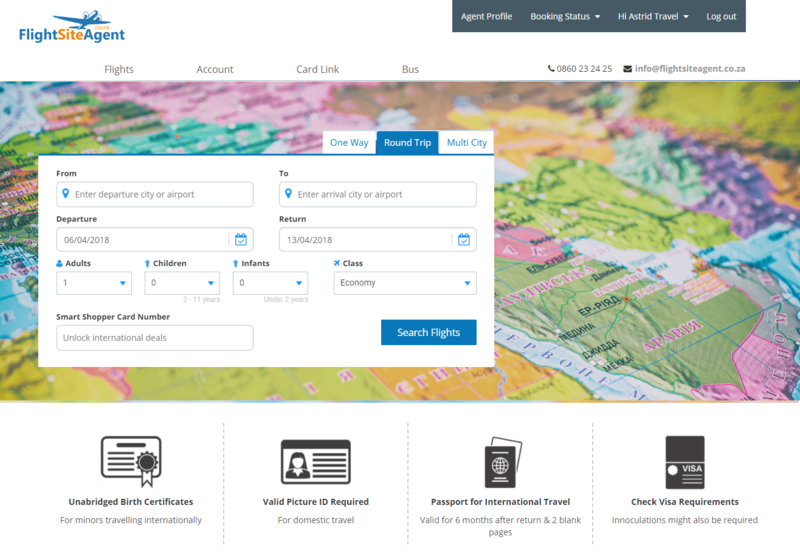 Once you’ve logged into FlightSiteAgent you’ll immediate be struck by our brand new look! We’ve rounded up all of the most important information on our home page, including everything from the latest travel requirements to blog posts and off course the flights booking engine. Our easy-to-use flights booking engine is still the main feature and can be located at the top. There you can choose between booking One Way, Round Trip and Multi City flights. Below the booking engine you’ll find a few important things to keep in mind when booking clients. When booking clients on international trips you have to check that all travellers are in possession of passport that is valid up to six months after their trip with two blank pages, make sure that they have all the required visas, and notify them if they require any inoculation. Additionally if your clients are travelling with children under the age of 18 years, you need to ensure that they have unabridged birth certificates. If you are booking clients on a domestic trip be sure to remind them that they need a valid form of picture ID on them. An Identity Document (ID), Passport or Driver’s Licence will suffice. Other new features includes our Valuable Information tab where you can download all the important documents that you might have lost since you registered as well as links to the latest and most popular blog posts. But of course the cosmetic makeover is just the tip of the iceberg! The layout has remained fairly similar, with the options of selecting One Way, Round Trip and Multi-City flights still located at the top. If you are looking for a multi-city flight you can add up to three sectors on the system. Should you require a quote on a multi-city with more legs it is advisable to come through to our team. On the results page you’re able to filter the flights using the Filter option located at the top left-hand side. Results can be filtered according to airline, departure and arrival times and price. You can also choose to only see direct flights. At the bottom of each result you’ll find dropdown options to see the Fare Breakdown and Air Rules. When accessing the Air Rules, you have to click on each sector and wait for that sector’s rules to display below. Please give these time to load as it needs to access data from our GDS. Proposed itineraries can still be forwarded to the client either via SMS or email. On the new system we use the phrase “Reserving a booking” instead of “Blocking a booking” when you put a flight on hold. Reserving a booking can be done in a few simple steps. Simply search for the flights you desire, select it, provide the passenger information and then choose to Reserve Booking the booking rather than making payment on it. If a booking has been successfully reserved it will load a page with an FNM number. Both bookings that have been successfully and unsuccessfully reserved can be located under the Account tab. It is still just as easy as ever to generate a card link, but now you need to add more sensible information. You can no longer add any comments, but instead you’ll have to provide the client’s name and contact details as well as the total amount (including your commission). Bookings made on the old FlightSiteAgent system still reside in our GDS and back office, but have to be manually imported into the new system. Unfortunately this process will take time. Should you need to urgently access a booking made on the old system, please contact our support staff to assist in loading it immediately. Have your GDS reference and client details at the ready for quick assistance. Bookings blocked on the old system would have expired, but should you wish to book or reserve the same flights you still need to contact the team to check with the airline. Don’t proceed to make a duplicate booking on the new system as the airline could fine (ADM) you. If you have made a booking on the new system or had an old booking loaded onto the new system and you’re in possession of the FMN number you can easily find a booking by clicking on Booking Status and entering the FMN number. If you are not in possession of the FMN number, you can still easily find a flight (or a number of flights) by either searching the date range within which you made the booking or searching through bookings made either on that day, the last 30 days or the last 60 days. All FlySafair flights can now be booked directly on our system! We’ve finally integrated FlySafair into our booking engine giving you online access to FlySafair flights at prices similar to those on FlySafair’s website. We used to assist in making FlySafair bookings offline, but going forward we will no longer be making FlySafair bookings offline for free. We’re now pulling inventory from Amadeus, the same GDS that FlightSite and Club Travel relies on. Moving over from Galileo to Amadeus was a big priority for us as Amadeus’ fares are often more competitive than those available on Galileo. We’ll also gain access to specially negotiated rates as soon as they are loaded into the system, no longer having to wait on deals to be loaded specially for us. We also won’t be losing out on deals that can’t price in Galileo any longer. Please do take into consideration that this booking engine is a work in progress and bear with us as we continue to add more of your favourite features over the coming weeks. We plan on welcoming back bus bookings within the next few days.. Following that we’ll focus on adding hotels and car hire options to our booking engine. In the meantime, feel free to contact our support team should you require further clarity on anything. We trust you’ll grow to love our new booking engine as much as we do! ← FAQ: What is a Global Distribution System? I can no longer sign into my dashboard? Whats happening? You should have received an email with the new login details just over two weeks ago. If you can’t find it you can contact our team at info@flightsiteagent.co.za to assist with login details on the new booking engine.